David Ivory has a very distinctive English style of playing, which is now becoming fashionable again. Taught church organ by John Fear (All Souls, Langham Place) David became organist of several churches including the large and one time important parish church of St Mary, Bury St Edmunds. It was Vic Hammett who, having heard tales of one of David’s more showy church recitals, arranged for him to try the Christie organ at the Embassy, Braintree. David was hooked! Up until that time David’s only experience of theatre organ were his prized 78s of Dixon, Foort and Newman. He also became a full time electronic organ demonstrator for a chain of East Anglian music shops around that time. In the early 1970s he became weekend organist at the Rex, Stratford playing the 2/7 Wurlitzer to the East End Bingo crowd. John Stewart of the COS and Ralph Bartlett of the Theatre Organ Club both heard David play there and both arranged for him to give further concerts. These included many enthusiasts’ recitals in London cinemas as well as appearing for Granada themselves at East Ham, Welling and Walthamstow. One of the highlights at the time was being able to work with some of the ‘old timers’. These included Sydney Gustard, John Bee, John Madin and Bobby Pagan. 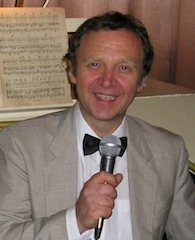 Since 1982 he has been the resident organist at the Mechanical Music Museum, Cotton, in Suffolk. There he plays to coach parties several evenings a week and appears in public on the last Sunday afternoons of May, June, July, August and September. The Museum houses a fine 2/11 Wurlitzer, ex Leicester Square Theatre, and a 3/8 + Melotone Compton ex Yarmouth Central Hall.